What does your state’s regulatory code look like? How does it compare to your neighboring states? State RegData attempts to answer these questions by applying the methods of the RegData Project to states. State RegData is generated by collecting state regulations, transforming thousands of pages of regulatory text into text files, and then analyzing them for key phrases associated with regulatory restrictions, such as “must” or “shall not.” In addition to restriction counts, we can also estimate the probability of a restriction affecting specific industries using North American Industry Codes. The datasets are used to construct “state snapshots” that give a summary analysis of each state, located here. 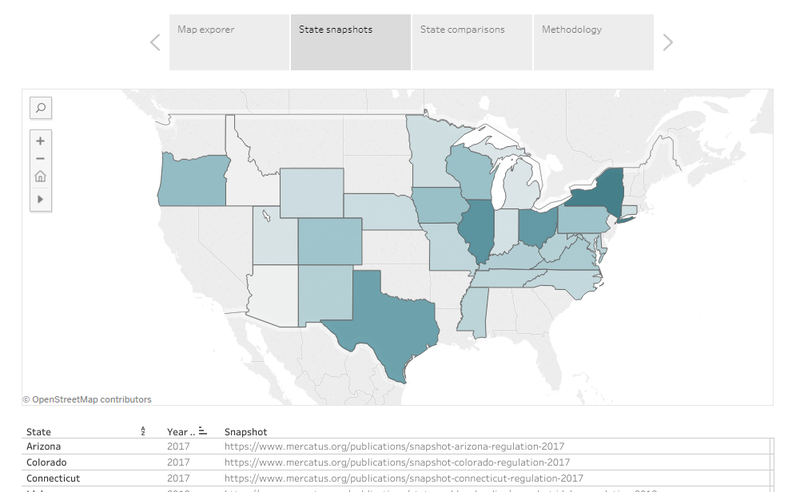 RegExplorer utilizes the State Regdata sets to create an interactive tool for learning about regulations in each state where a “state snapshot” is available (these states are highlighted). Different colors reflect the restriction counts for each state, and selecting a state provides a more detailed breakdown of its restriction and word count below the map. Tabs on the top of the map navigate to other visualizations, and the next tab has links to our state snapshots that provide context for each state’s data. You can select a state to filter out other snapshots, making yours easier to find. On the third tab, there are two tables that compare all states that have data to one another. States are ranked by word and restriction counts, key restrictive phrases, and restrictions as a percentage of total words. Under the final tab, you can find our methodology for data collection and analysis. RegExplorer offers governments, policy advocates, and the public a quick and easy way to navigate the State Regdata. Like our RegData Project, RegExplorer will be an iterative project with expansions and updates to both features and data available in the future. For more information on the StateReg project, please contact Andrew Blackburn.